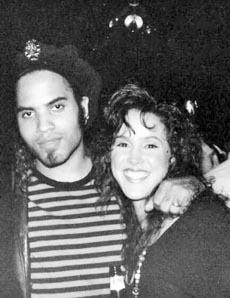 Lenny Kravitz and Susan Mansfield are pictured at the Green Parrot, a popular nightclub on Route 33 in Neptune, during the 1980s. If you wanted good times and really good music at the Jersey Shore during the 1980s, then you might have ended up at the Green Parrot on Route 33 in Neptune. “It was a great time – and a great time for music and FM 106.3 was way ahead of everybody else,” said Ocean Township resident Judi Yaccarino, whose family eventually owned the club. FM 106.3 has been compared to a commercial version of college radio station, playing artists years before mainstream radio and helping showcase local bands. The station played bands, like Redhouse and The Blases, and helped turn bands, like The Smithereens and Dramarama, into national acts. And together The Green Parrot and the radio station helped create an entire scene, with the radio station introducing people to the bands and the Green Parrot giving fans a place to see them. “We paid the Red Hot Chili Peppers $500 to perform and paid Lenny Kravitz $100. They were all just up and coming then,” Yaccarino said. Lenny Kravtiz made his first solo appearance at the Green Parrot. “We were all so blown away with his music that we went down to the Stone Pony the next night to see him again because he was so good,” she said. The original Green Parrot restaurant dates back to around 1940 and then was renamed the Gables Inn in 1974 and renamed The Recovery Room in 1976. Yaccarino‘s mother, Gail, and some partners purchased the business in 1981 and brought back the original Green Parrot name. Just east of the Jersey Shore University Medical Center, the Green Parrot site is now a parking lot. “They tore down paradise and put up a parking lot,” Yaccarino said. The new Green Parrot was a restaurant during the day and a disco at night until 1987 when the alternative rock and roll music came in and only bar food was served. “I was a hostess, waitress, and bartender there. I even worked the coat-check room. And I miss it every day, especially the people and the music,” she said. Yaccarino said that many former Green Parrot employees still stay in touch and a reunion was held two years ago at the Wonder Bar in Asbury Park. “But acts became more and more expensive and we just weren’t making it so we closed around 1991. But it was like a family there and we had a lot of christenings, birthday parties, and baby showers. There was even a bassinet in the band room for grandchildren,” she said. Original E Street Band drummer Vini Lopez said he remembers the Green Parrot, but the old Green Parrot, best for its pizzas. “My grandparents lived in a senior housing complex right behind the Green Parrot and I used to go there twice a week to get pizza. They had really good pizzas,” he said. “I never played with a band there. But, in its day, it was very popular,” he said. But Yaccarino said that Lopez should have also tried the chicken at the old Green Parrot. “They raised their own chickens in the backyard and served them on the menu,” she said. Posted in Shore Communities and tagged Don Stine, Music, Neptune.